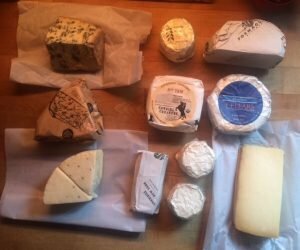 When I wrote the invite for this cheesetalk I had been sitting in Cambridge MA, and those of you familiar with the ongoings in Heinzelcheese land, or just generally knowledgeable in cheesy matters, knew where I would go to get my cheese: Ihsan Gurdal’s Formaggio Kitchen is a real paradise. 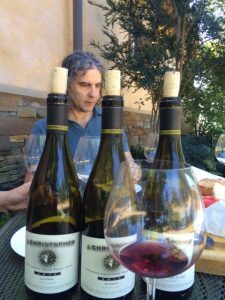 Of course, there was to be wine as well, I had had such a good time touring the vineyards with Jay Somers in the Dundee Hills in Oregon, and the Suff wine mongers in Berlin still have his gorgeous, seriously addictive 2009 Pinot Noir – hooray! Pure joy and super creamy the Cowgirls‘ Mt Tam Triple Creme from Petaluma north of San Francisco (which I tasted and checked when I was there, as seen on the picture – life is hard). 2014 Chardonnay Reserve from Reibold in northern Pfalz needed air and some dedication, but unfolded beautifully; a new star who much enjoyed meeting Manchester from Consider Bartwell. You all really liked Jay Somers‘ 2009 Dundee Hills Pinot Noir (who wouldn’t), and almost forgot the cheese over it! 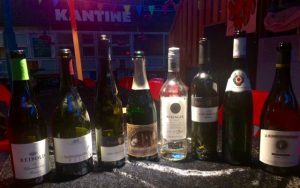 But the Twig Farm’s Washed Wheel knew how to attract your attention, and the lovely Harbison with its spruce rind and resiny aromas from Jasper Hill in Vermont also stood up. With the Cabot Clothbound Cheddar from the same caves we opened another 2009 Pinot, this one from Sven Leiner and his Kalmit vineyard in southern Pfalz. The tannins were somewhat drier and darker, but altogether very elegant and good with the cheddar. 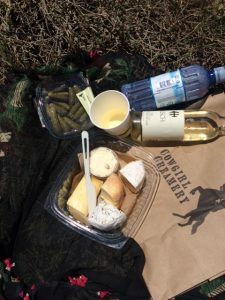 With the blue cheeses we switched to sweet wine: Ruppert-Deginther’s 2015 Riesling Spätlese was as juicy and delicious as a fresh, perfect peach. 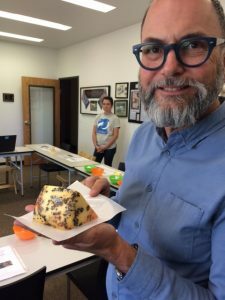 David Gremmels‘ Oregon Blue was only a first glance of the great blue cheeses he makes at Rogue River Creamery, hopefully we’ll have the man himself over for an extensive tasting at the beginning of next year. Cheerio, my friends – cheese makes so much more sense than politics right now.